A quick note : Income inequality in pre-industrial societies was, in general, lower than in modern industrial societies, but traditional agrarian economies tended to be closer to their “maximum feasible inequality” than modern ones. The idea is, there is an absolute level of subsistence income for the mass of peasants who are creating value in the traditional society. Above that level is the surplus, or the amount of income which can be expropriated by elites ; and below that amount… starvation for the producers in the economy. Thus, in a very poor society whose average income is close to the absolute survival level, the surplus extracted is pretty small and therefore inequality cannot be very high. But as average income rises, there is potentially more to extract. So the interesting question becomes, did pre-industrial societies at different levels of income have different “extraction levels” ? Put another way: did peasant incomes also rise when the average income rose or did the increase simply lead to more elite extraction ? (You can click the above image to enlarge.) Subsistence income is assumed to be $300 in 1990 international dollars. Some countries considered very unequal, like modern Brazil, are definitely more unequal than most pre-industrial societies, but it’s much farther from its “potential maximum inequality” precisely because it produces much more income than Peru in 1876. There’s just more to go around. Here’s also a full page of comparisons with modern and preindustrial societies. There are signs that Indian income distribution was significantly more unequal (and so popular consumption more limited) than it was in China, Japan, or western Europe. A study of Mogul land taxes for 1647 finds that 445 families received 61.5 percent of all revenues, which were about 50 percent of gross agricultural output, and that roughly one-quarter of the revenue flow to those families represented actual personal income. (The rest was consumed in various expenses of office.) If this is accurate, these 445 families— presumably less than .002 percent of the population—would have received an income from their offices alone equal to 7.5 percent of total agricultural output, or perhaps 6 percent of the society’s total income! An estimate based on Shireen Moosvi’s reconstructions for 1595  is similar: it suggests that 1,671 Mughal nobles would have had a net personal income from their claims on government revenue alone equal to about 7 percent of total empire-wide output. Mughal India does appear (in the table in the link above) to have been particularly extractive, but the other two historical values for India — especially the one for Bihar circa 1800 — not nearly as much. And you’d expect Bihar — one of the most benighted places on earth — to be a particularly exploitive place ! So Pomeranz may have been overgeneralising from the Mughal intensification of the preexisting zamindari system in north India. 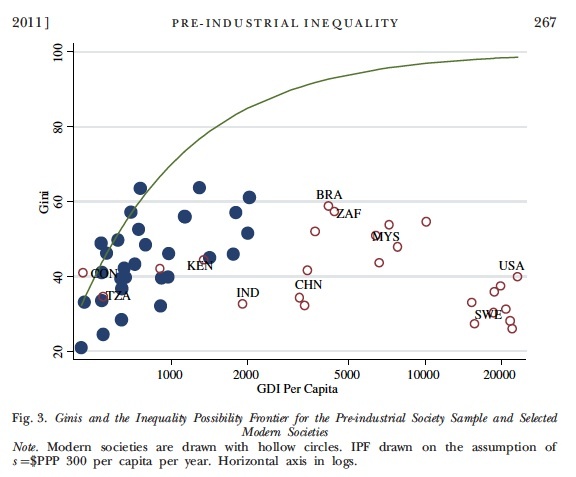 This entry was posted in Branko Milanovic, Income distribution, Inequality and tagged inequality extraction ratio, inequality possibility frontier, maximum feasible inequality, predustrial inequality, preindustrial income distribution. Bookmark the permalink. 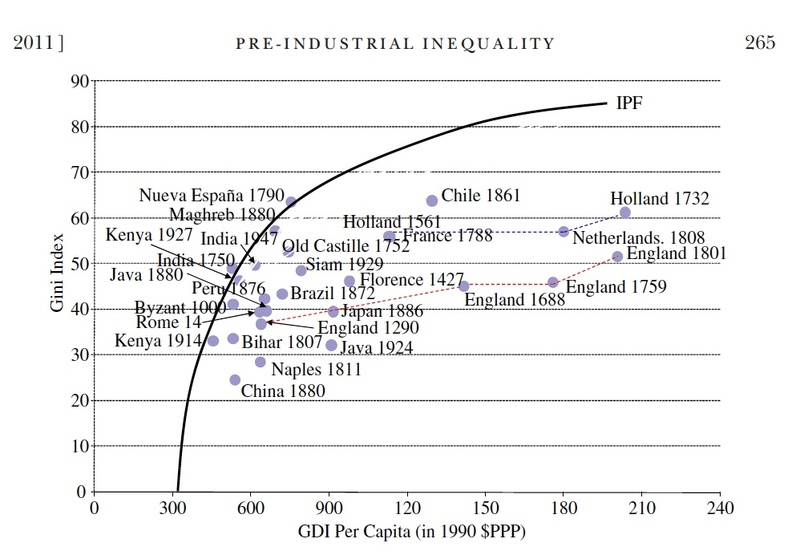 This is very interesting, but the graph and commentary seem to disagree with the full page table regarding 1880 China. In the table, China 1880 is at 55.2% extraction, lower than 1668 England and Wales’s 57.2% extraction. Looking at the graph more closely, it agrees with the table that China 1880 was far from its potential maximum inequality, even further than 1688 E&W. This surprises me, and makes dying Qing China an outlier among non-European pre -industrial societies, but that what these data say.